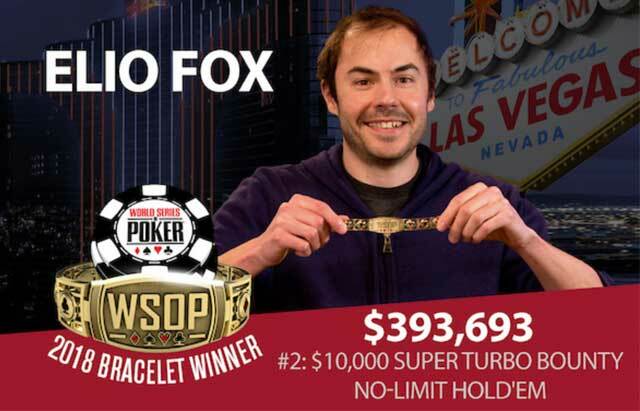 Early results help Fox and Volpe to top of the WSOP POY race early in the series. Headed into the second weekend of the 49th Annual World Series of Poker, Elio Fox continues to hold the lead in points in the early race for the 2018 Player of the Year. Elio Fox, the 2011 World Series of Poker Europe Main Event winner, captured his second career in Event #2: $10,000 NLHE Super Turbo Bounty. After collecting his $393,693 for the win, the New York native then jumped right into Event #5: $100,000 NLHE High Roller. He navigated a tough final table that included the Stephen Chidwick, Jason Koon, Adrian Mateos, Bryn Kenney, and eventual winner Nick Petrangelo. Fox nabbed another official payday of 1,798,658 for his runner-up finish (although rumors of a chop with Petrangelo were circulating). In total Fox has amassed 1743.65 POY Points to lead the pack. Right behind him is Philadelphia, PA’s Paul Volpe. Volpe has been ever-present early at the WSOP, registering three cashes within the first week. Most notably, Volpe captured his third career bracelet and $417,921 by winning Event #9: $10,000 Omaha Hi-Lo 8 or Better Championship. Volpe also appeared at the final table of the aforementioned Event #2 finishing in third place for over $169,000. The run good continued as Volpe had a profitable showing in the $100,000 NLHE High Roller, making the final two tables and over $155,00. Currently, Volpe only sits 121.65 points behind Fox with a total of 1,622 POY Points. 2009 World Series of Poker Main Event winner Joe Cada presently sits third in the Player of the Year race with 1,527.57 points. Like Volpe, Cada also has put together a string of results early, bolstered by the winning of his third career bracelet. Cada outgunned all three of his tables in Event #3: $3,000 NLHE Shootout for $226,218. “The Kid” was also seen at the final table of Event #2, pulling down $16,024 for his ninth-place finish. His most recent WSOP cash came in Event #7, the 13,070 player $565 Colossus. He made the top 100 of the massive field and added $4,446 to his bankroll. His cash in the Colossus marks his 31st lifetime cash at the series. The winner of the $100,000 NLHE High Roller, Nick Petrangelo lands in fourth place based solely on his performance in Event #5. A regular on the high roller scene, Petrangelo earned his second career bracelet in this event as well as an official sum of $2,910,227. While it is unlikely that the Massachusetts resident will be jumping in any of the “smaller” buy-in events. he will very likely have an opportunity to accumulate more POY points playing the $10,000 events, as well as the Main Event and the $1 Million One Drop. Petrangelo currently has 1,269.75 points. Julien Martini rounds out the top five, having earned 1,026.20 POY points. Martini bested the 911 player field in Event #4: $1,500 Omaha Hi-Lo 8 or Better to earn his first career bracelet and $239, 771. No stranger to big spots in poker, Martini has a live earning career total of $530,764 including a victory in a $5,000 WPT event in late April. After playing in the WSOP for years, the French grinder found this to be a dream come true. “It was a dream when I was 14 years old. What kind of guy can win a $1,500 tournament or a $10,000? I was dreaming about this for seven years, and it is one of the best things in my life. I am very proud and super happy,” Martini said.